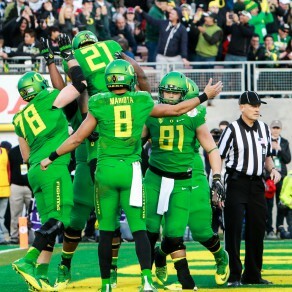 Another touchdown for the Ducks in the 2015 Rose Bowl. First and foremost, we’d like to thank you for this past season. You could have left us for the NFL a year ago, where you would likely have been the No. 1 pick in the draft, but you chose to come back to get your degree. There are very few people in the world who would turn down a payday like that, but then again, you’re not like everyone else. You came to Oregon with a mission, and you saw to it that you achieved the goals you had set for yourself and for the team. This season was one for the ages. It was, without a shadow of a doubt, the greatest season in the history of the program, and it wouldn’t have been possible without you. You guided us to a Rose Bowl victory, took us to the National Championship game and brought home the University of Oregon’s first Heisman Trophy. The above accomplishments are more than reason enough for us to be proud of you, but those accomplishments hardly tell the full story. For as much as you did on the field, you did just as much off it. You broke nearly every record in the book this season, but you’d be the last person to ever talk about that. It’s just not your style. You’ve always been reluctant to take any credit. You’re an”us,” “we,” and “team” guy. You spent your time off the field volunteering at places such as the Boys and Girls Club, and made a major impact in our community. In a time in which we see so many big time athletes make the wrong choices, you quietly went out and did the right thing — every day. Perhaps the moment that made us most proud was the night you were awarded the most coveted trophy in all of college football. That speech you delivered was nothing short of amazing. The humility you displayed is rarely seen anymore; it brought tears to many of those who watched it (including Kirk Herbstreit and Lee Corso). We beamed with pride that night. We were so proud to call you one of our own. We didn’t want to see you go, but we completely understand. You’ve accomplished virtually everything imaginable during your tenure here at Oregon. You earned your degree and you snagged the Heisman on your way out. It really is time for you to take the next step with your life. You just may be the No. 1 pick after all, and there’s no way you could turn that down two years in a row. We wish you phenomenal success in the NFL. We hope that you have many All-Pro seasons and Super Bowls in your future. While some “experts” have questioned how your talents will transfer to the next level, we have no doubts. You’re a winner, Marcus. Your drive and commitment to excellence simply won’t allow you to be anything short of extraordinary. We know that you’re going to be a force to be reckoned with on Sundays, and regardless of what jersey you wear, you can count on us to root for you. 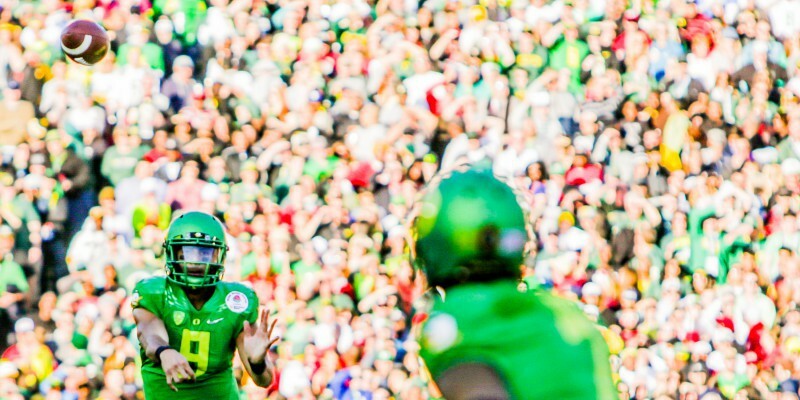 Unequivocally the greatest quarterback in Oregon history.